Put simply, 2018 has been a big year for the Royal Canadian Mint. In the past few months, they've released three exciting new silver coins: the 1 oz Incuse Maple, 1 oz Dog Privy Maple, and the 30th Anniversary Maple. On top of that, RCM unveiled the 2018 Golden Eagle. This 1 oz piece is the world's purest gold coin with a fineness of 99.999%! Then, the Mint announced new MintShield protection for all 2018-dated silver Maple Leaf coins. In essence, this technology is designed to minimize the appearance of milk spots and keep Silver Maples in pristine condition. Now, we're pleased to unveil one more brand new product from the Royal Canadian Mint: the 2018 10 Oz Silver Maple. Dubbed the "Magnificent Maple," this coin is one of the largest produced by our neighbors up north. Not only are they impressive in terms of size, but the Magnificent Maple is also beautifully crafted in .9999 pure silver. As you may recall, the Magnificent Maple first debuted last year. The 2017 issuewas the first coin of this type. If you'd like to add a 2017 coin to your collection too, we have a small quantity left. Since these are no longer made, this may be your last chance to grab a 2017 Magnificent Maple at a low premium. Our first batch of 2018 Magnificent Maples is scheduled to arrive next week -- and you can be one of the first to get this coin! We're now accepting pre-orders for as little as $1.69 per ounce over spot. Lock in your coins now and reserve your place at the front of the line! 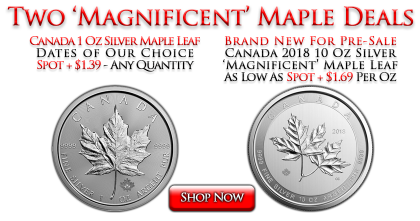 With all this talk about new 2018 coins, we wanted to offer something special on backdated Maples too. Today, we're offering a limited number of Random Date 1 Oz Silver Maples at just $1.39 over spot for any quantity! If your goal is to own Silver Maples at the absolute lowest premium, this is the very best option. Today's sale price is well below the cost of brand new 2018 pieces. Take advantage of this special pricing on brand new 10 Oz Magnificent Maplesas well as backdated 1 oz Maples. Whether you're looking to add something unique to your collection -- or stock up on low-premium sovereign silver -- these two deals are for you!